Jane earned her DPT (Doctor of Physical Therapy) from the MGH Institute of Health Professionals in 2012 and returns to Cape Ann PT after having completed an internship here. 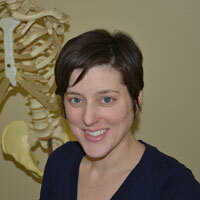 Jane has worked in a variety of settings but specializes in outpatient orthopedics, treating a wide variety of conditions. A proponent of continuing education, Jane is currently completing a fellowship at the Institute of Orthopaedic Manual Therapy, and enjoys combining manual therapy with education and exercise to help patients regain function.